The Rock(topuss) will not stop! Tony here with an update, because it’s been a while. This year we have been ravaged by solar flares, fought Rocktopi, and weathered all manner of cosmic mishaps. Earlier in the year we had a lineup change and the past few months have been spent scouring the landscape of Mars and the rest of solar system for a guitarist and bassist to fill the mighty space suits of our former members. The new members are now ready for new interstellar adventure and we will be filling you in more on that very soon. We just wanted to say thanks again for all of your support and hope to see you soon as we spread the Mars Metal throughout the universe once more. and through Cdbaby and our awesome friends at Ozium Records http://www.oziumrecords.com/shop/details/953 for physical copies. We are also streaming on every service that digs Mars Metal. Check out this awesome video Billy Garetsen did of himself creating his latest Rocktopuss painting. If you haven’t done so already, go check out Billy’s Deviant Art site and all of his awesome artwork. This Rocktopuss artwork is featured on the poster for our Dec 28th, 2013 show at the Red Eyed Fly. This will be our last show of 2013 and we’re excited to end out this awesome year rocking with all of you! We often joke around at shows that we are from Mars, and will someday head back to our home planet to put on an EPIC rock concert. That day may be closer than you think is they have discovered clean water on Mars. 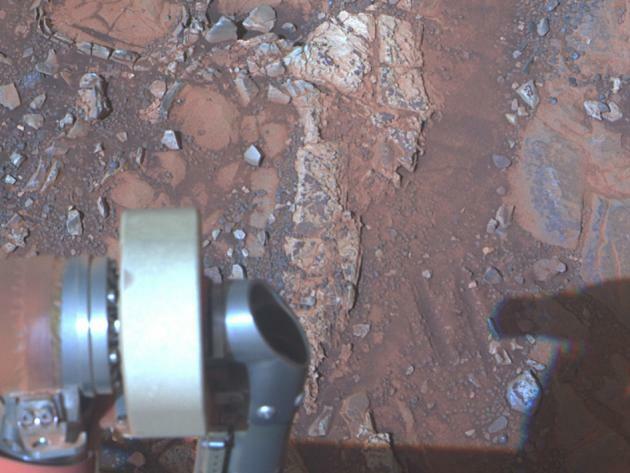 The NASA rover Opportunity while out poking about looking for things discovered that not only is there water on Mars, but now they have proof that there is water of neutral-pH (essentially benign drinkable water) there. WOW. How cool is that?!?!? Checkout this article for a deeper dive into the pool of life-giving water on Mars and prepare yourself to quench your thirst while we rock the red planet!